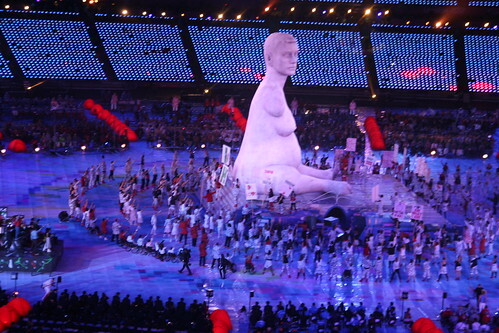 I went to the Opening Ceremony last night. At this point, everything is slightly blurry! So much going on when you’re in the stadium that I don’t think the brain settles on one thing to remember. I was entranced with the umbrellas, slightly bored with the parade, clapping with glee at some of the flying athletes and in awe, and tears, at the flame lighting. I loved the ceremony, even if it ran way over, providing anxiety about getting home! ON walking in, for the warm-up show, this is what was greeting us. None of the pastoral scenes from the Olympics, but a big stage. 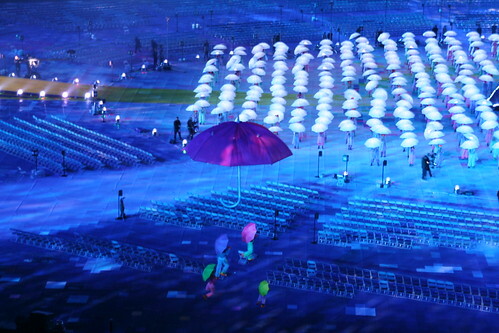 With lots of umbrellas dotted around. the story still had routes in The Tempest, but it was a different take, using Miranda as the focus, who takes a journey to find knowledge. Science, that’s what the rest of the show was mainly about. Science and the wonders that it can show and the wonders that people can do. Stephen Hawking was one of the star turns, complementing Ian McKellan. Hawkings’ words were projected onto the screens and rang round the stadium, about discovery and investigation and being curious. I was amazed. This was all about science and its power. I loved it. 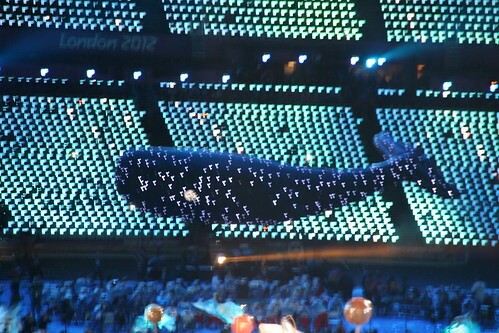 It was a fairly short first act before we got onto the athletes parade. There were 164 countries and inevitably, they took far longer than planned. During this 2 hours or so, people were up and down, grabbing food, drink, loo breaks etc. There were polite cheers for the teams, some louder than others. Commonwealth nations were generally welcomed well, European nations were also well cheered, depending on who was there. But for most, this was just a waiting period. 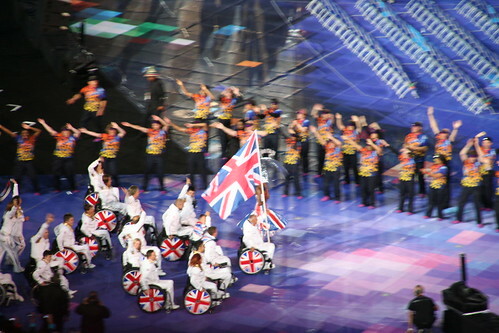 Finally, finally the GB team came out last, to huge cheers, flag waving and a standing ovation. The crowd was just, a little partisan. This is what we’d come to see! Some of the athletes did not stick around, doing a lap and heading straight out again. But most settled down into the seats provided to watch the third act. 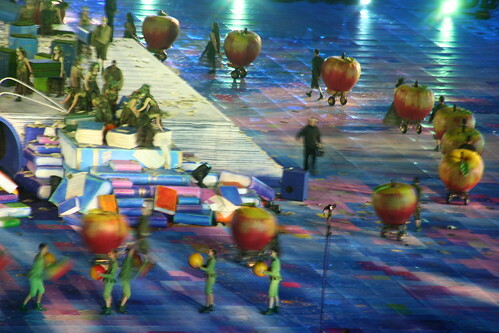 IF the first was umbrellas, the second the athletes, the third was all about apples. Back the science again, taking inspiration from Newton. We had flying people in wheelchairs, men whirling with skirts on fire, a boat carrying Miranda traversing the sea in search of knowledge. It was a call out for the wonders of books and learning. It turned the stadium into the solar system and into the Large Hadron Collider. Hawkings and McKellen were back as narrators, guiding us on the journey. It was the breaking of glass ceilings, the demonstration that ambition should not be constrained by what others thought – or expected – you could do. That ended up with the largest ever co-ordinated apple crunch! 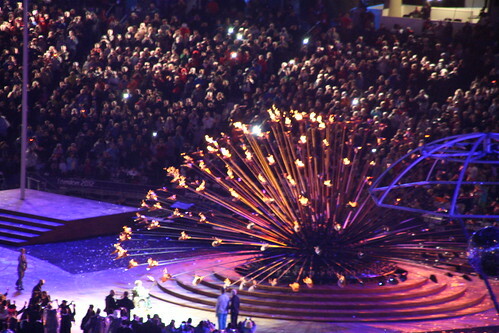 Finally, the torch came into the stadium on a huge zip wire from the Orbit, before being passed to Margaret Maughan, Britain’s first ever ‘official’ Paralympic Gold from the 1960 games, who lit the petals. 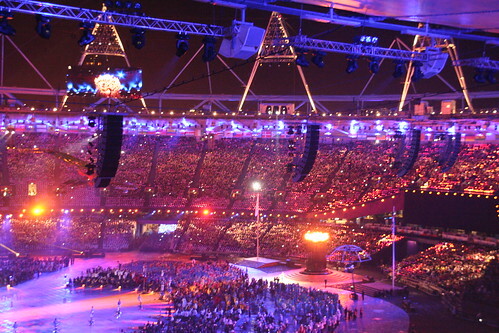 The final event was Beverley Knight singing I Am What I Am..but at this point the stadium started emptying. It was running late and we had to get home! One benefit of this, is that if you were outside the stadium, you got a great view of the fireworks! The mad dash for the exits started. The crowd was controlled, I got on a Jubilee line easily then remembered – change at West Ham for District. yay – the tubes were running later than my app was telling me and I was on my way home. No buses and few taxis available, but I finally got home just over 2 hours after I left. Brilliant night, loved the show and I’m going to have to watch bits to work out what happened in some of them. Loved that the focus was science and learning and the power of the human spirit. Bring on the Games!!! 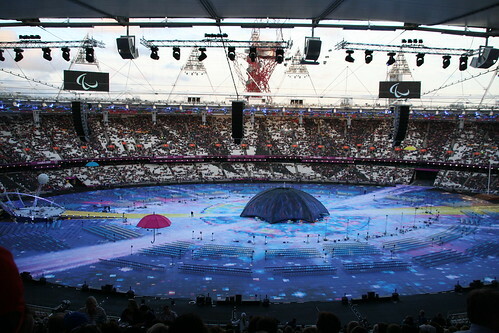 This entry was posted in events, London2012 by Rachel. Bookmark the permalink.